Welcome to Evernote Client App Documentation. This document will contain the research and development information of the client I am planning to develop and utilize in daily basis to safely store my documents and books and any other files. The purpose of the tool is to stop worrying about hard disk space and confidential document's accidental deletion etc. This tool can upload any file to evernote client. A scheduler or batch job program Or a stand-alone application which can be automated/scheduled or run-when-needed. 1. Retrieve the file from file system. 2. Prepare details about file system w.r.t to evernote such as Note Name, Notebook Name, File location, Split attribute, File Type etc. 3. Store the information in the database for reference purposes and tracking purposes. 4. Upload the files to Evernote System. Update notebook name from the properties file. Update staging table with file object details. Upload each file to evernote with the details of staging table. Update record with note link and notebook details in database table. If CRC does not match mark it upload failed and delete note from evernote. All checks have been successful. Update a google sheet or microsoft excel sheet with the details of the upload. Insert file object details to database staging table. Upload file to evernote system. 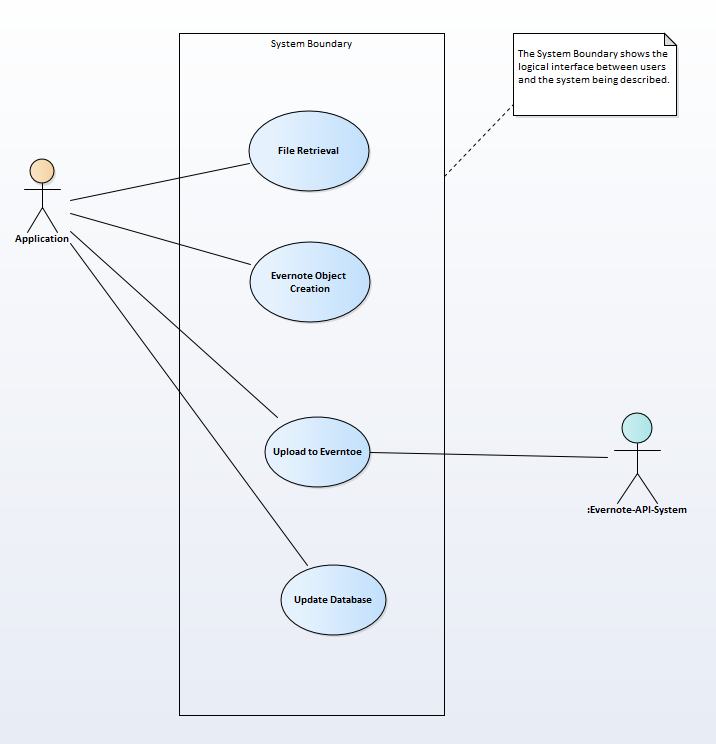 Below is the basic Use Case Diagram of the Program.